One of my favorite things about the autumn holidays is baking with pumpkin. Every year, I try at least one or two new pumpkin recipe. This one is an homage to the people in my life who have gluten issues. I call this recipe gluten-free but be aware that the flour I chose to use is spelt. If you have a gluten sensitivity, you’re probably able to eat spelt. But if you have Celiac Disease, this isn’t the recipe for you. Pumpkin is a strong flavor and usually trumps any other flavors that it’s combined with. 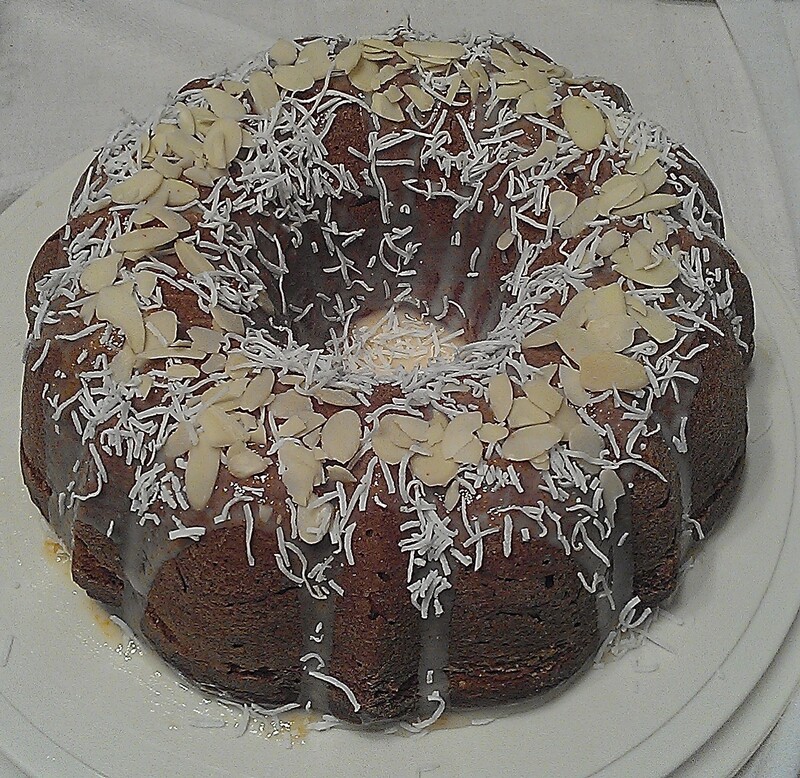 I wanted to make the coconut in this cake as bold as I could, so I used coconut in several forms: coconut sugar, coconut flour, coconut milk, coconut rum, and shredded coconut. 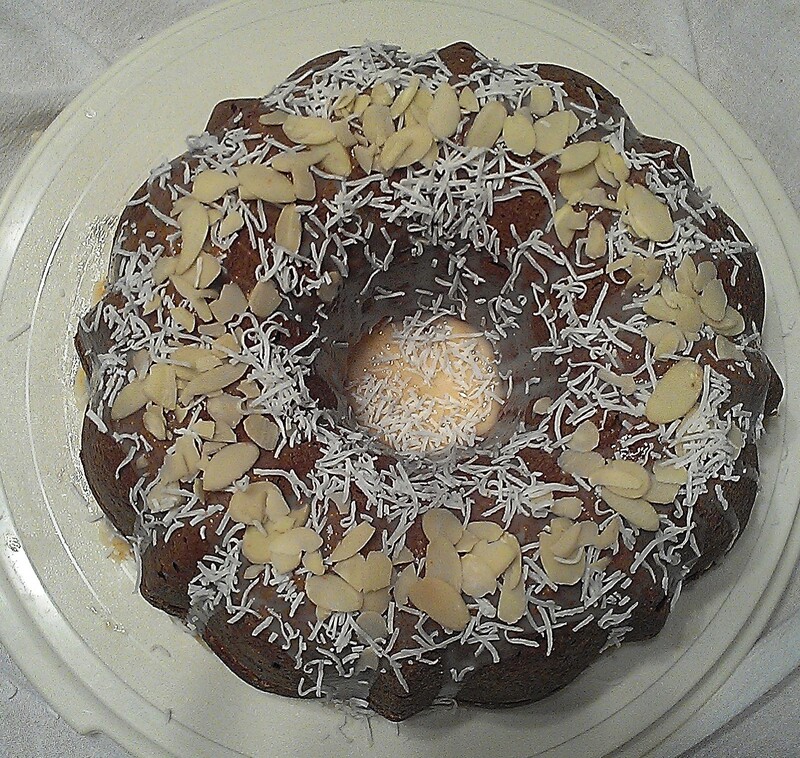 This cake is dense but moist with a nice little crunch from the shredded coconut. And best of all, those of you with gluten issues don’t have to miss out on the pumpkin goodness at the holidays. Enjoy and have a safe, healthy, happy Thanksgiving. Grease and flour a 10-inch cake pan. Preheat the oven to 375. In a medium bowl, whisk together the spelt and coconut flours, baking powder, baking soda, cinnamon, nutmeg, salt. Place shredded coconut in a small bowl and pour rum over it. Mix and let sit. Cream together the butter and coconut sugar until fluffy. Add eggs one at a time, incorporating each one. Beat in pumpkin puree, coconut milk, applesauce, and vanilla. Gradually add flour mixture and mix until well blended. Fold in shredded coconut and nuts. Pour into cake pan and bake 1 hour and 15 minutes, or until a knife inserted in center comes out fairly clean (the knife will be slightly wet but you don’t want to see raw batter coming out). Place on a cooling rack and let cool completely in pan, then invert onto a plate. The cake will be fragile while it’s hot. Place confectioner’s sugar in a medium bowl. Add 1 teaspoon each bourbon and cider, then a little more at a time until it reaches the right consistency. Pour over cake. Decorate as desired. Categories: Baking, Cakes, Desserts, Gluten-free, Holidays, Recipes, seasonal cooking, Uncategorized | Tags: apple cider, baking, cake, gluten free, Pumpkin | Permalink. Give it a try! It’s really easy.